Behold the HEBS (high efficiency brewing system), which is capable of producing some eye-popping efficiency numbers for the right brewers. As the saying goes, it’s not the size of the brewhouse that matters, it’s the level of efficiency. Oh, you never got that one? Well, doesn’t make it any less true, which is why we wanted to highlight a couple of these less heralded but ultra-efficient brewing systems that just may lead to the process gains and savings your fledgling brewery needs. For the high efficiency brewing system (HEBS), the name says it all. The system comes in four sizes (1 hl, 20 hl, 30, hl and 40hl), but the 20 hl is the most popular among customers, According to Jeffrey Gunn, president and CEO for IDD Process & Packaging, this 20 hl system (about 17 bbls) will match up favorably with an equivalent 30 bbl system due to its innovative construction — and can just about double in output to achieve up to 100,000 bbls per year. 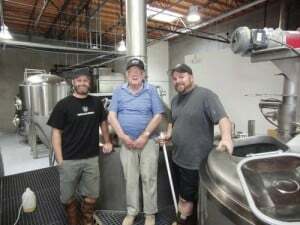 Coachella Valley Brewing basks in its new mash filter glory. Coachella is using a 20 hl brewhouse that yields between 40 and 80 bbl batches. Anderson says they have three 40 bbl fermenters and two 40 bbl bright beer tanks, as well as three 80 bbl fermenters and one 80 bbl bright beer tank tank. Pho Fridays are something to celebrate. Morgan and Mark Fethers, owner and founder, got there after eschewing the traditional system they were using, which needed about 270 to 290 minutes in between brews, for their new HEBS, which only needs 130 to 180 minutes. The key to the HEBS is the mash filter. Traditional mash lauter tuns incorporate water and grain together, then the mash sits for an hour saccarafication rest, during which time the grain settles on the screen and allows for the layer of grain to act as a filter bed. The liquid is recirculated to develop clarity and lessen turbidity of the wort. At that point, the wort is run to the kettle and the sparging or rinsing of the mash begins. This will continue until most of the sugars have been rinsed from the grain bed. Some sugar and water are left behind in the grain and discarded in the form of spent grain. Dale Lewis liked this on Facebook. Carter Baptiste liked this on Facebook. Jeff King liked this on Facebook. is it nearly mini macro brewing? I think we could make up something like that out of a few dairy tanks!